As we’ve screamed from the rooftops time and time again, Spain has endless options for creating amazing travel memories. From Barcelona and Madrid, to its lovely southern region of Andalusia, the Iberian Peninsula has something for everyone— including some amazing islands. If you really want to check out a unique part of the country that many people overlook, head to the Balearic or Canary islands. But, take it from a regular visitor, if you really want something special, head to beautiful Mallorca! Honestly, you could probably spend various days or even weeks to explore all the entire island of Mallorca, but your best bet would be to plant yourself in its capital for a few days to see its top sites. 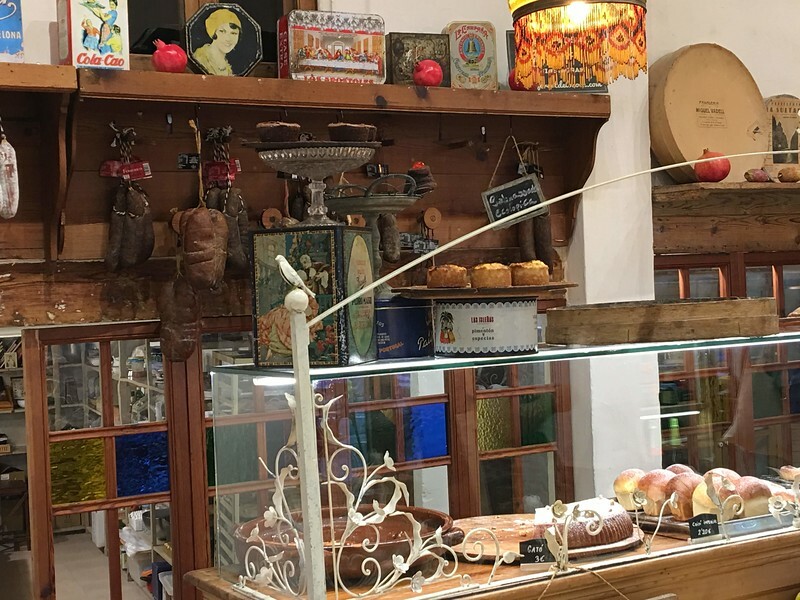 Guest contributor Geanie Roake from The Library Lady Writes, is here to share her tales of finding boomer adventures in Palma de Mallorca. Palace and cathedral – good neighbors. 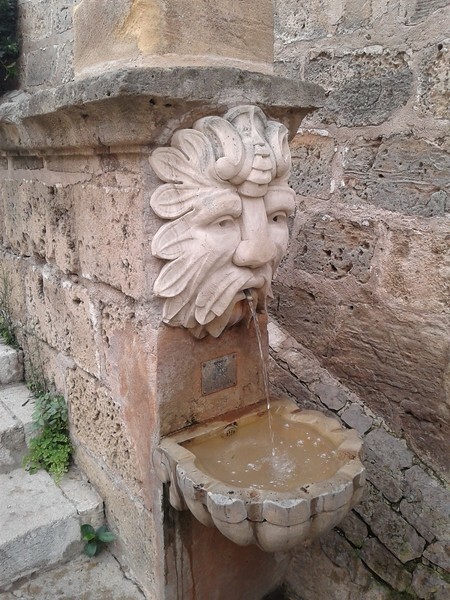 Seeing the three major sites of Palma de Mallorca in one day is like trying to sample all 20 flavors at the gelato stand – a bit of a challenge, but we did it and so can you. 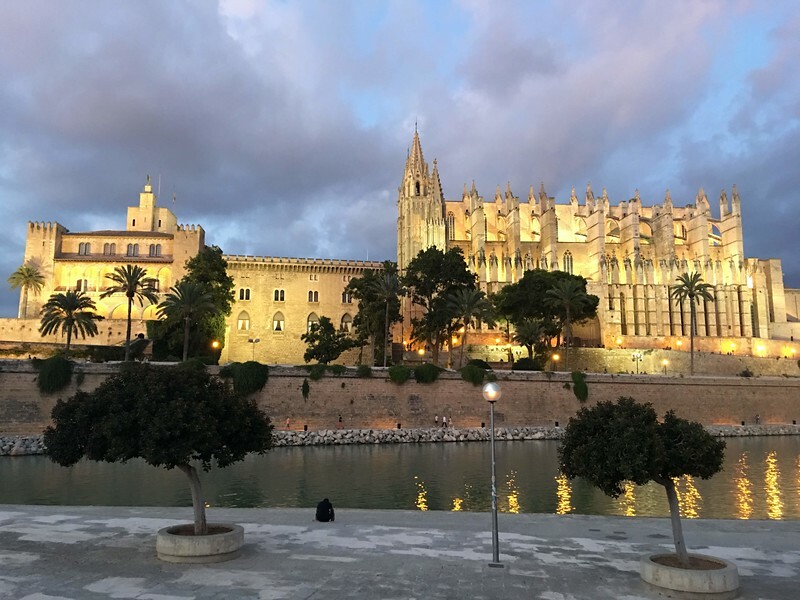 While some may choose to forgo the gelato part of this adventure, no one should miss Palma’s terrific trio – Bellver Castle, Almudaina Palace, and the Cathedral de Mallorca. There were four of us on this tour of Spain, my husband and I, and our travel friends, the Lambs. We’d spent a week in Madrid, another in Malaga, and now we were based on the island of Mallorca. 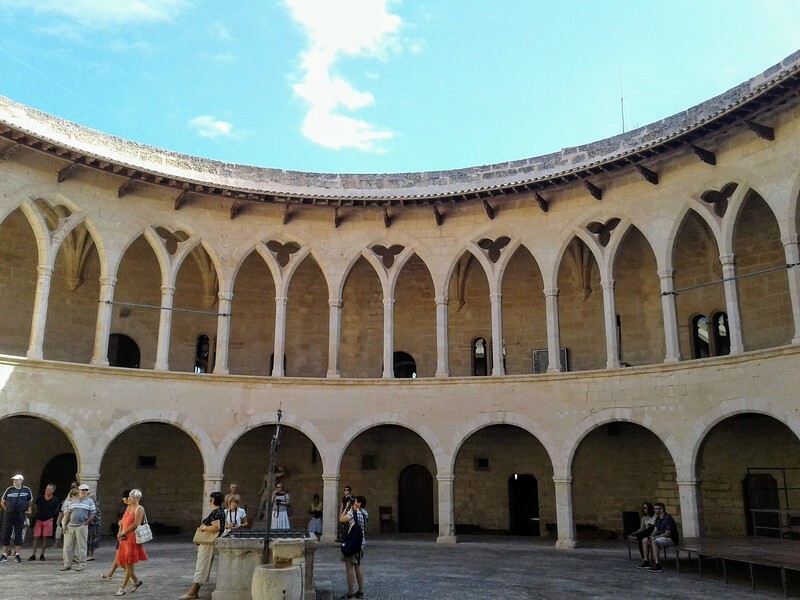 We had only one day to visit the famous city of Palma de Mallorca, so we rose early. After dining on bakery fresh rolls and local fruit we piled into our rental car and drove to our first stop, the Bellver Castle. The Bellver Castle courtyard is spectacular! 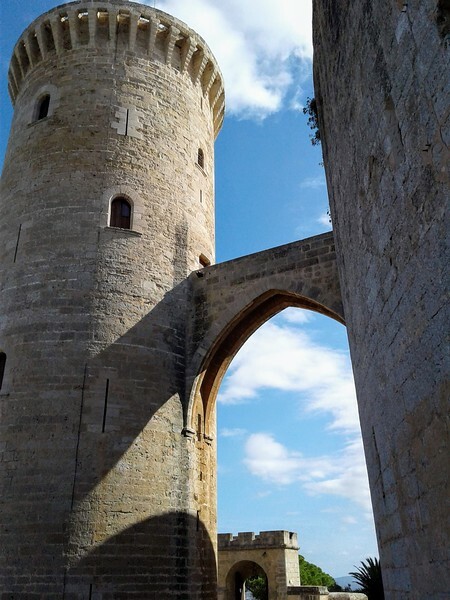 This unusual round fortress is located 3 kilometers west of Palma city center. This translates into a 10 or 15-minute car or bus ride. As a fervent castle fan, I tried not to swoon at the sight of this grand citadel perched high atop a hill. The white stone surface shone against a cloudless sky, and it wouldn’t have surprised me to see a knight in shining armor ride out of the trees. 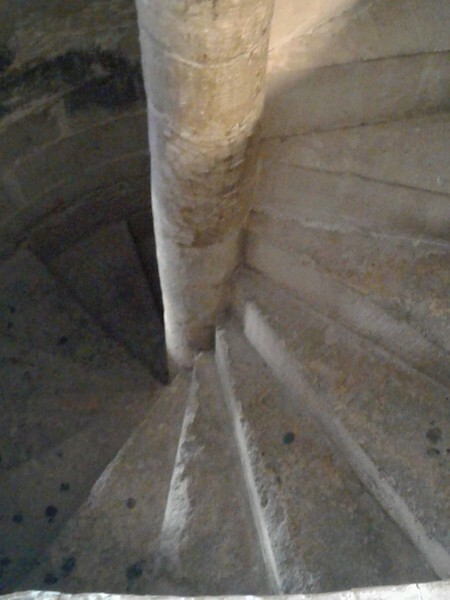 The castle stairways were treacherous. Watch your step! Bellver castle was built in the 14th century, as a residence for the King of Spain. It’s believed its form was inspired by the Herodium in Israel – a round fortress built by King Herod between 23 and 15 BC. The Bellver’s inner circle is large and open, with an ancient well in the middle. The surrounding arched doorways stacked on top of each other create a lacy effect reminiscent of grandma’s doilies. The courtyard is flanked by three minor towers and the donjon, or stronghold of the castle, and the entire structure is surrounded by a moat. Guests of Bellver are welcome to read the informative pamphlet and wander on their own or take part in a guided tour. Keep in mind that for the tour to happen you must have at least six in your party. Visitors with smaller groups will quickly need to make new friends if they want the input of an expert. 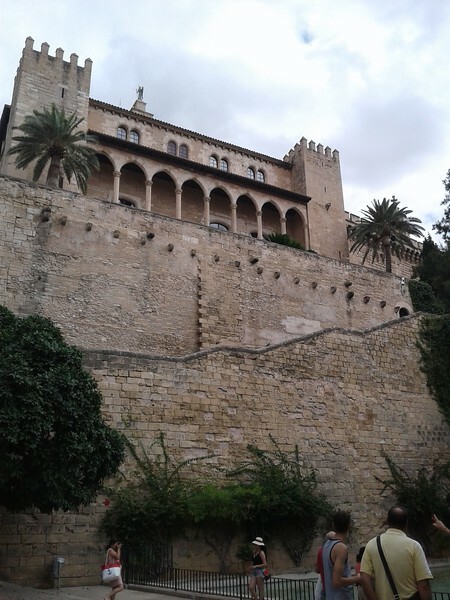 From Bellver castle we retraced our steps to the Palma city center, home of the Palace Almudaina and Cathedral de Mallorca. This area is a photographer’s dream, with a beautiful park and manmade lake fronting two magnificent structures. The fact that both sites are situated right next door to each other is a lucky break for tourists, but it does create a parking problem. A massive underground parking lot is available and it’s very accessible in the early hours, but as the day goes on, not so much. We arrived about 11:30 and by that time the lot was full. After waiting patiently until the electronic arm allowed us to enter, we circled around for about 10 minutes before finding a park. The waves of the Mediterranean used to crash against these walls. Construction on this striking Alcazar began in1281 and was rebuilt by King James in 1343. The palace has been well preserved and it’s fun to imagine what life here must have been like in the middle ages. Scenes from the Arabian Knights fill your mind as you explore this Moroccan style edifice. 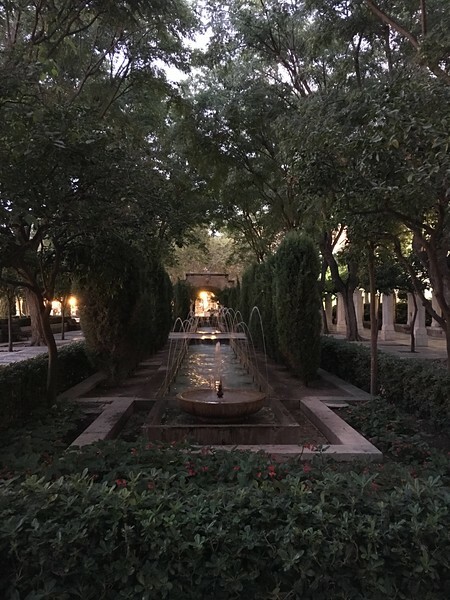 Palm and lemon trees line walkways which lead to fountains and reflecting pools. Thanks to stone walls which are five feet thick in some places, the interior is surprisingly cool – a welcome respite from the sweltering heat outside. Have we inspired you to plan a Spanish adventure? Check out our Spain Destination Guide for some help! The water features were cool and inviting. The Almudaina is part museum, part living quarters. The ground floor is a nod to the middle ages, with paintings, tapestries and furniture from the 15th century. Make sure and see the Arab baths, and the Chapel of Saint Anne. The upper floor which contains government offices and a suite of rooms for the King and Queen of Spain, is decorated with items from other royal sites of the 17 – 19th centuries. Someone had a sense of humor! Looking for a place to stay in Palma de Mallorca? Start your search for hotels in Plama de Mallorca with us! The palace used to be fronted by the sea, and ships could sail right up to its docks to unload their treasures. This changed in 1960 when the land in front of the palace and neighboring cathedral was reclaimed as part of a road building project. 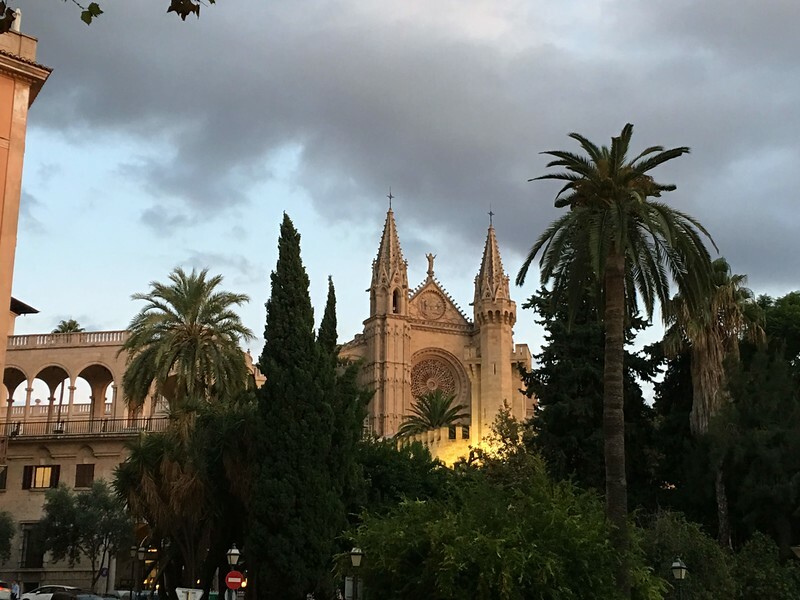 The Cathedral de Mallorca will always have a place in my heart. The sheer beauty of this medieval masterpiece stopped me in my tracks when I first set eyes on it. Rows of Gothic towers reach for the heavens and dwarf the tiny people standing nearby. It took 400 years to complete the Cathedral de Mallorca, which is hardly surprising when you see the result. One of the cathedral’s claims to fame is its distinctive watery reflection. Initially its likeness shimmered in the Mediterranean Sea, but after the land reclamation project, it was no longer ocean front property. Later, when the Park Del Mar with its beautiful manmade lake was placed in front of the Cathedral and neighboring palace, the famed reflection was restored. Interesting angle of a minor arch. The interior is a celebration of light and space. The supporting columns are slender and tall, soaring 21 meters or 70 feet. With 87 stained glass windows and 7 rose windows, it’s no wonder this is called the Cathedral of Light. The nave is adorned with a canopy of lanterns and hanging mobile sculptures, created by Antoni Gaudi, which represent the crown of thorns. There was a hushed air of reverence in the chapel, broken only by faint echoes of organ music, and we sat quietly trying to absorb the sense of peaceful contemplation. To the right of this spiritual sanctuary was another section, created by a sculptor named Barcelos. It’s very modern and has a completely different feel from the rest of the cathedral.It’s supposed to represent the miracle of the loaves and the fishes, but that takes A LOT of imagination. In one part of the installation you see human skulls, and fish with bulbous eyes popping out of a sea of plaster. Frankly, we thought it was odd and out of sync with its surroundings. Lots of fun shops along La Rambla. As we re-entered the real world, we decided to take a stroll down the La Rambla. This pleasant tree-lined avenue has a vibrant feel, and it’s a fun change of pace from all the antiquity. There were lots of shops and sidewalk cafes, and we enjoyed the vendors, musicians and street performers. This is a great place for a meal or a chat on a shady bench. 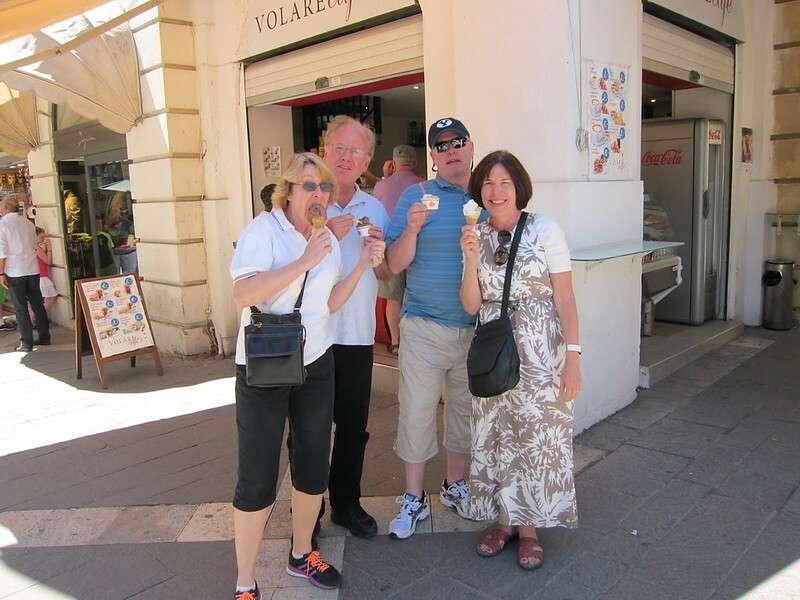 After a hot day touring the sites, a refreshing gelato was definitely in order! As the sun began to set, we returned to the Parke Del Mar and sat across from our new favorite cathedral. We lingered, enjoying the magical sight of the illuminated church and its enchanting mirror image in the lake. The night was balmy, and somewhere in the shadows a man played a guitar and sang love songs. It was the perfect end to an amazing day in Palma de Mallorca. While I’m the first to admit it would be more relaxing to space these activities over two days, there is something to be said for the sensory overload method of touring. It’s surprising how far you can stretch 24 hours, and my memories of Palma are a pleasant blur of bundt cake castles, Arabian knights, and the reflection of Gothic towers on a moonlit lake. All in all, a delightful experience. *Hours Tues – Sun 10 A.M.to 6 P.M. Underground parking for the Cathedral and Palace is 3 Euros. It’s crowded but convenient and safe. *These sites are closed for lots of cultural and religious holidays, and hours vary. Be sure to check on line before you plan your trip. Geanie Roake is a freelancer from Salt Lake City who loves to see new places and write about all her adventures. Her motto is, Have Money Will Travel! Check out her website at The Library Lady Writes.